The renowned midcentury pottery manufacturer introduces four new glazes for its vase collection, including a remarkable textured finish formulated by partner Adam Silverman and the Heath design team. New Heath Ceramics glazes for the Heath Vase collection, from left: Cool Lava, Lemongrass, Tangerine, and Indigo. A fellow San Francisco-based company rooted in modern design, Heath Ceramics has always been a Dwell favorite. Cofounder Edith Heath designed the original bud vase in the 1950s; the company expanded the vase range with three other silhouettes in 2008. 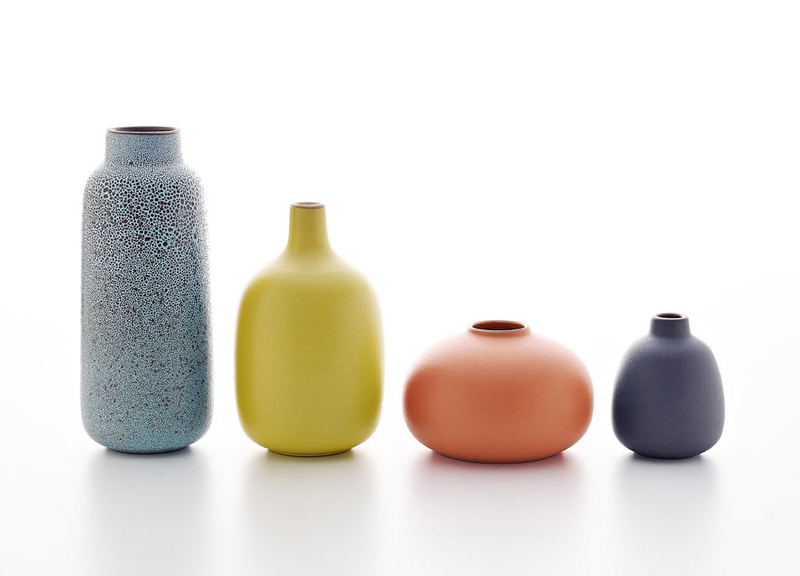 Now, as of March 1, there's a new color palette for the four vase shapes. The best part? They aren't limited edition, but a part of the permanent collection. While we love the new and cheery, midcentury mod yellow-green, inky blue, and tangerine hues, the all-around champ here is the new Cool Lava glaze, a textured, spotty finish that LA-based partner Adam Silverman has been experimenting with. Prices range from $23 for the classic, three-inch bud vase to $91 for the nine-inch-tall Multi-Stem Vase.